Check this out, I recently got a bunch of free clay pots from a nice lady on Craigslist. 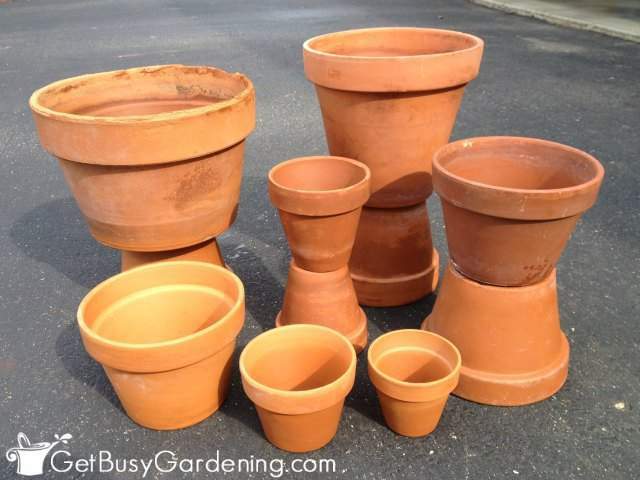 There were about 25 various sized terracotta plant pots in total – awesome score, right?! 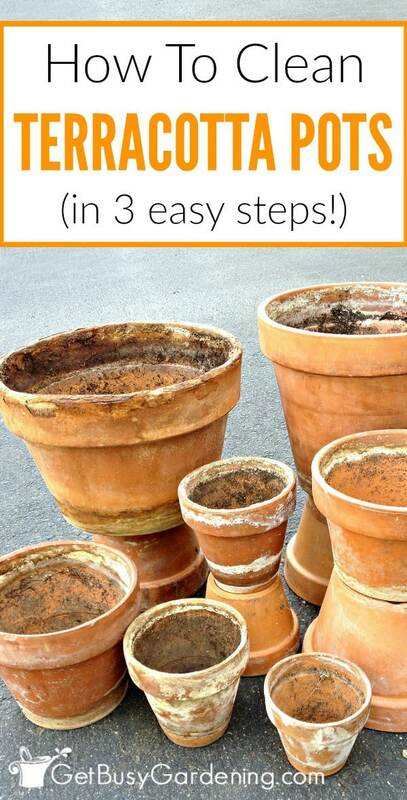 Step 1: Remove any loose dirt from the pot. 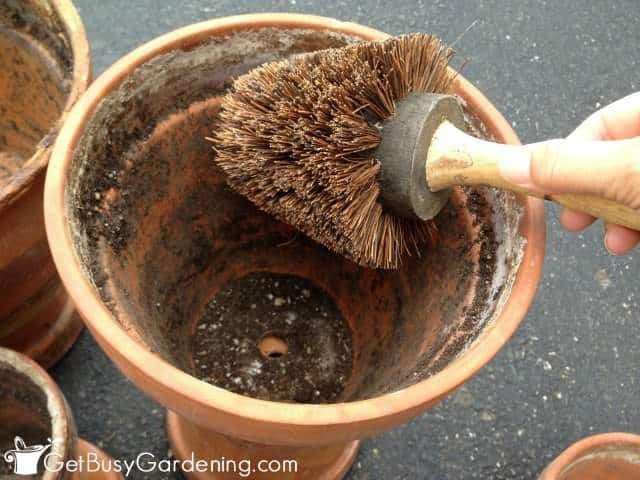 Use your pot brush to clean as much dirt as you can off of the clay pot. In my case, I also needed to brush cobwebs and other debris off my pots (yuck!). WOW! Can you believe these are the same terracotta pots? 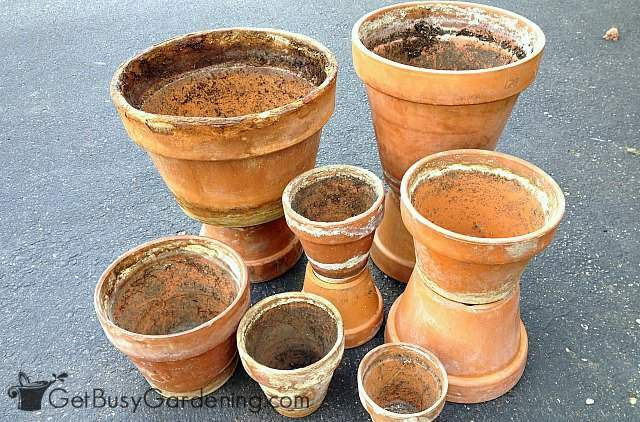 Why buy terracotta pots brand new when you can save yourself tons of money with just a little time and elbow grease by cleaning old ones! Share your tips for cleaning terracotta pots in the comments section below! I've used a similar combo of equal parts water, white vinegar + rubbing alcohol) and sometimes a solution of one part bleach to 10 parts water, which means I can skip the dishwasher step (which is a good thing because my dishwasher is tiny). Great, thanks for sharing your formulas! 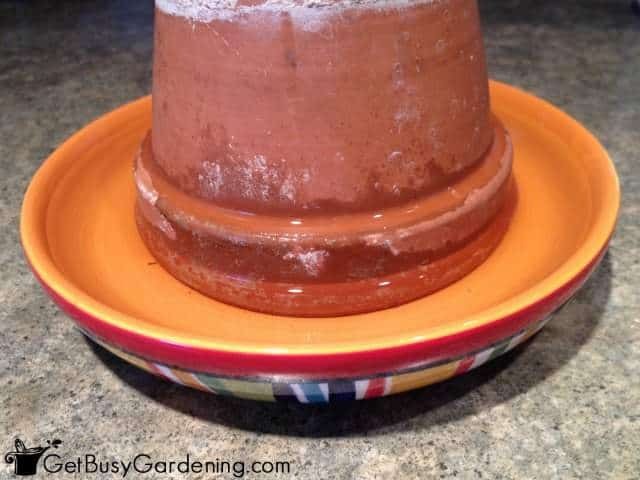 It's always good to hear how other people clean terracotta pots. 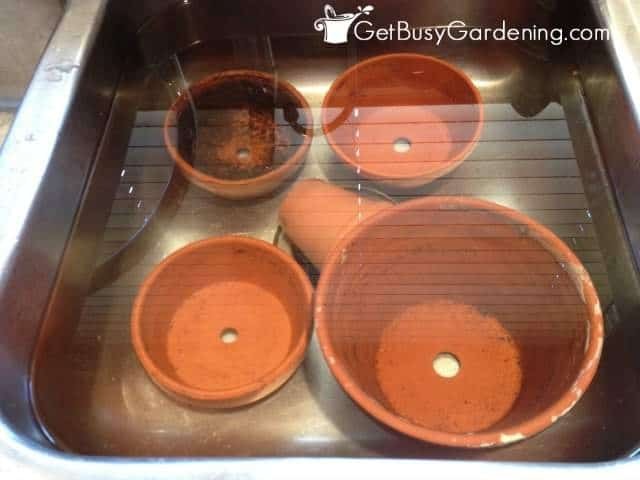 I've used the same bleach solution for disinfecting plant pots that aren't dishwasher safe, and my seedling trays. Very cool, thanks. 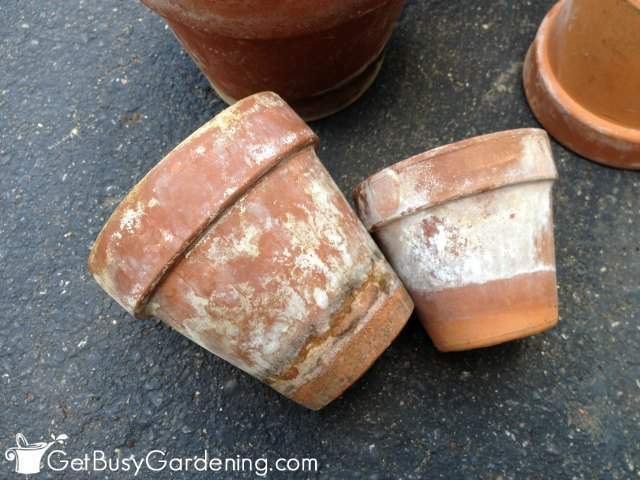 I've often seen terra cotta pots for cheap, or free, at garage sales or estate sales, but have always been put off by the icky buildup on them since I didn't know how to clean them correctly. Now I know, bring on the pots! You're welcome! 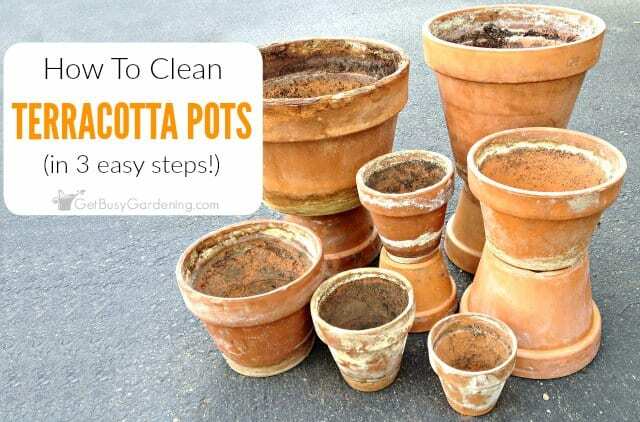 LOL, now that you know how to clean terracotta pots, you won't find any. Well, that's usually the way it goes for me at least. 🙂 Good luck! This is an awesome post and I am going to share! 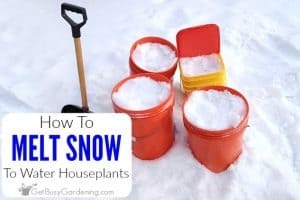 I have always wanted to know how to get rid of this stuff and reuse my pots! Thank you so much! My dog has urinated on my terra cotta pots. Will the vinegar and water remove the stain also? LOL, that's not good! I can't say for sure because I've never tried it… but I would expect the stain would be removed if you cleaned your terracotta pots using this method. 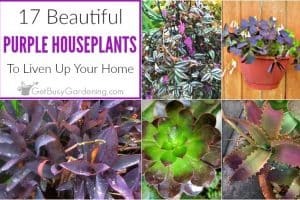 You could try scrubbing your pots with a pot brush and soapy water first if your there are plants in them you don't want to remove. Otherwise, I would try soaking the clay pots in the vinegar/water solution (remove the plants first). You could also add a small amount of bleach to disinfect them, which would also help to remove the stain. I remember my granddad always cleaned his pots each year before he used them, he used to talk about pests or diseases or something. I never bother but I am no where near as good a gardener as he was. I don’t know what method he used either but this looks easy and effective, thanks. Thank you for sharing this! We have our pots outside since we moved to New England in August- they need a big cleaning! Would putting them in the dishwasher with vinegar in place of detergent work as well? Just wondering if anyone has mentioned this process? 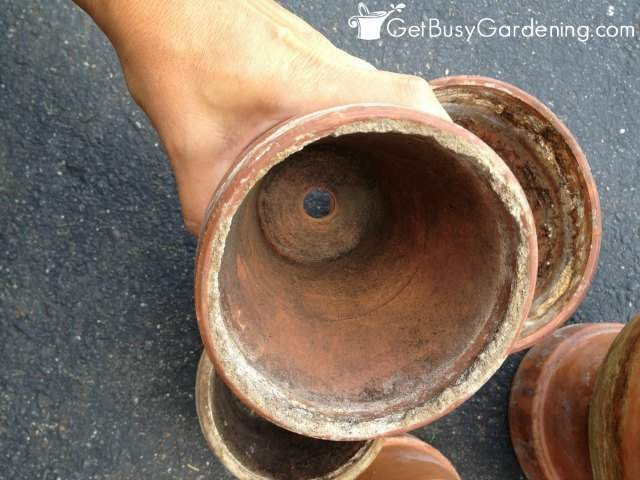 It won’t work to remove the crusty buildup on clay pots. You need to soak the pots in the vinegar solution long enough to dissolve the buildup. 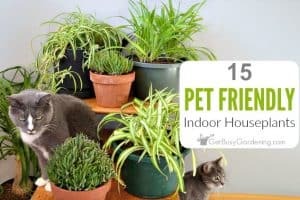 Simply running them through the dishwasher with vinegar won’t be enough to remove the crusty buildup – but it will clean off the dirt and other residue, and disinfect your pots. 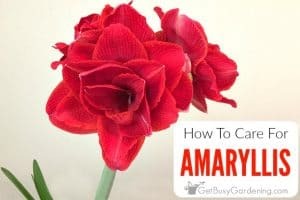 Amy: great article, as always. So glad you mentioned the chemical buildup in clay pots. Just another reason go organic for the benefit of those awesome microorganisms in healthy soil! Thanks Patrick. Yes, another great reason to go organic, for sure! I am seeing alot of pots being painted. Is that safe for the plant? Seems it may defeat the purpose of a clay pot? Great article! Thanks! As long as the paint doesn’t contain lead, then I don’t see any harm in it. It can defeat the purpose of clay pots if a sealant is added, but terracotta pots are readily available, and are wonderful for crafts and painting. 🙂 Here’s a post I wrote with tons of info and step-by-step instructions for painting terracotta pots. How can I re-paint the terracotta pots? If possible to do it? How?